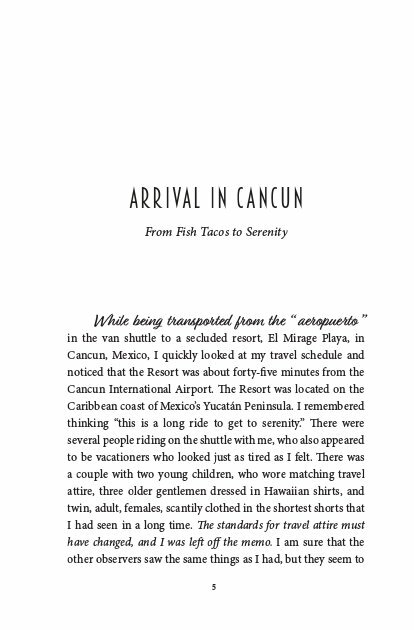 Hot & Bothered in Cancun is the first installment of a 10 book "Travel Escapes"Series. Bria Rasmussen a young, professional, women will take you on a journey of self-discovery, exotic travel destinations, and encounters with the most exciting people that you would ever want to know. On her first trip, Bria is traveling to Cancun, Mexico and has her sights set on rest and relaxation. But the trip didn’t quite start out that way. Only when she ventured outside herself did she experience the culture, people and adventures that Cancun, Mexico is known for. At the same time, she discovers that she is quite the traveler, and has set out to acquire so much more during her travel adventures. What will be her next destination? Gaining a better understanding of who Bria really is first, can you figure that out. At each destination, Bria will come to understand herself so much more and why her travel escapes are so necessary. Tag-a-long, with her and you will find yourself traveling to these destinations too. Enjoy the ride! Bria Rasmussen has had it. She’s spent her entire life living according to her parents’ standards of school/work/home, and while she’s managed to establish a successful career, she feels like she’s missed out on the fun life has to offer. Throwing her carefully-instilled caution to the wind, Bria plans her first trip out of the United States—but will she find what she’s looking for in Mexico? Landing in Cancun, Bria is quickly seduced by the sun, sand, and the rich Mexican culture—including, of course, tequila. And the people she meets convince her that a trip was the right idea. But when it’s time to leave, will Bria be able to say goodbye and go back to her normal life? Or has her quick taste of what the world has to offer left her hungry for more? Hot and Bothered in Cancun is the first book in the Travel Escapes series. Hot & Bothered in Cancun by Beverly J. Ray is a breezy read that combines travel, adventure, and one woman’s search for herself into a hilarious ride. Meet Bria, a woman who has known nothing beyond her native city, but who quickly gets seduced by the idea of traveling somewhere, thanks to a friend’s encouragement. So, she books a flight and reserves a hotel in Cancun, Mexico. Follow her odyssey as it takes her into the heart of the Mexican people; watch her experience the thrills of immersing herself in a new culture, the joy of hospitality, the excitement of discovery, and as she drinks from the cup of new friendships. Here is a story that allows readers to discover one of the great travel destinations in the world and the fun stuff they can do there. This book is slim and a very quick read, but it’s a gem for fans of travel stories, a book for readers who want to do something new, something different. Bria’s travel experience doesn’t just take her to new places, but it allows her to discover other layers of her personality and I enjoyed how the author allows this aspect of the narrative to come out. I couldn’t help but think that traveling is a gift that brings us into contact with other people, into encounters that allow us to see ourselves even more clearly. The writing is friendly and confident and the reader is enthralled by the excitement and the exuberance of the protagonist. Hot & Bothered in Cancun is both informative and entertaining, and Beverly J. Ray does an awesome job in keeping the reader engaged from the first to the very last page. Beverly J Ray is an avid traveler, and uses her travel history as inspiration in her writing. Her current project, "Travel Escapes" gives readers the opportunity to travel to destinations around the world, at their leisure. Beverly lives in Arizona with her husband Frank, their adult children and their grandchildren.